﻿﻿MB Focus Laboratories (MB=Microbiology) has provided quality lab testing services since 2010. The services include microbiology-related testing and projects, particle numeration and identification, molecular projects, and validation studies. The microbiology testing are for molds, yeasts, environmental bacti, water (coliform, Ecoli, Enterococci, Legionella). Samples are from IAQ (indoor air quality), pharmaceutical, agriculture (plants and soils), and foods. We carry out the work on molecular biology, R&D (research and development) projects, and consultations. We are committed to make your job simpler, but we never do a simple job. Our expertises are to detect, identify, numerate, investigate, and characterize microorganisms, e.g. fungi (molds and yeasts) and bacteria, in environmental, agriculture, and other industrial settings, using conventional and molecular tools. As an Executive President of MB Focus Laboratories, Dr. Jan (Young) Bao is a certified Laboratory Director by The NY State Health Department, and has decades experiences in the related fields. Dr. Bao can be reached directly by sending email to labdirector@mbfocuslab.com, or info@mbfocuslab.com, or call /text to 202-390-1362. The company is located in Washington DC metro area (Contact Information). Best Lab 2018 Awarded!!!!! 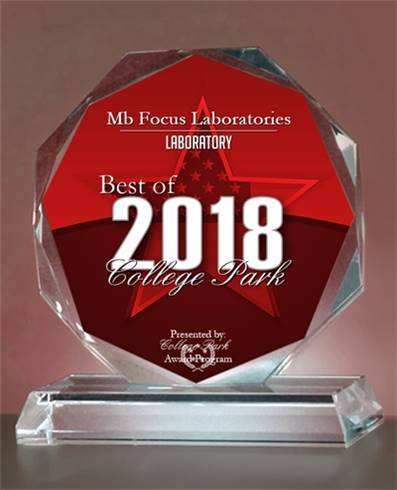 MB Focus Lab was awarded as the 2018 best local lab!!! New COC Format. A new COC format is available. It is easy to fill and print. Download it now and save a copy in your computer (2018). Mold ID online: Photoes (morphology on plate/under microscope). Report contains the photoes, mold ID, and its brief description. Contact the lab for more detail (2018). Validation Study. Provide validation study from design to implementation, report writing. Please contact the lab for detail (2018). Best Lab Award. 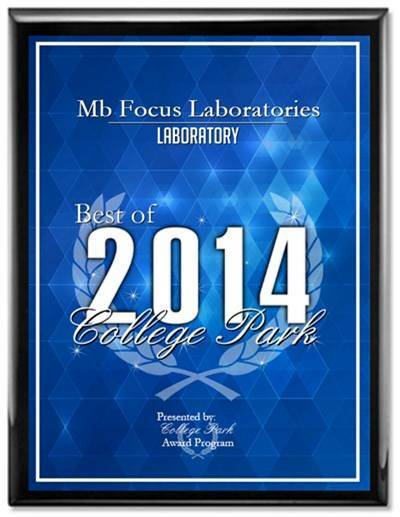 MB Focus Lab is proud of being awarded as the 2014 local Best Laboratory. Endotoxin Test. ﻿Endotoxin Detection /Screening test? Please see the Testing Notes. Lab Director Certified by NY State Health Dept! Congratulations to Dr. Jan Bao!!! Dr. Bao has been certified as Laboratory Director by NY State Health Department. This is a great honor for the lab with such prestigious certificate. It is also a great news for our clients. The certificate copy is available upon request. Free Shipping by FedEx? Please call, text (202-390-1362), or email to the lab for shipping account #. Free Agar Plates: Free MEA or PDA for molds and yeasts cultures, and Free TSA for bacterial cultures for MB Focus Lab clients!!! Or you can purchase the plates from us ($12/sleeve of 10 plates+shipping fee) for non-MB Focus Lab clients. ﻿Free Pump Rent for Air Sampling. Rent a air sampling pump for free if your samples are sent back to MB Focus Lab for testing services. Otherwise, a rental fee will be applied. ﻿New Report Services. Add microscopic photoes (and/or the sample photoes) from your samples to make your report more impressive? We can add photoes on your reports upon request. Additional fee ($10 per sample with 2 photoes each) may be applied. Molecular testing? Contract projects or specific clients only so far. MB Focus Lab has launched molecular (PCR and Sequencing) testing services together with phenotypic characteristics to detect and identify microorganisms (molds, yeasts, and bacetria). This testing is for contract projects or specific clients only so far, not for routine testing. Contact the lab for details. ﻿Also, The fillable Mold Sample Submission Form (Spore trap and Direct exam) is available on the website and can be saved in your computer!!! We are committed to providing highest quality results in a timely manner with competitive prices. Our laboratory ensures scientifically sound and defensible data. Reports are in a user-friendly format, with customized reports available. Our professional team is always ready to answer your questions and address your concerns. Copyright 2011 MB Focus Laboratories. All rights reserved.